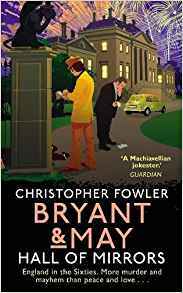 Today I’m delighted to welcome Christopher Fowler to the blog as part of the tour for his new Bryant & May book, Hall of Mirrors. In case you haven’t encountered them before, the Bryant & May mysteries are a bit different. Readers often ask me what they’re most similar to, and I’m really hard pushed to think of anything they’re like. You could say that Arthur Bryant and John May are Golden Age detectives who’ve been left behind in a modern urban world. They head the Peculiar Crimes Unit, London’s oldest specialist police team, a division founded during WWII to investigate cases that could cause national scandal or public unrest. (My father worked in something very similar.) They’ve been there forever but won’t leave – and why should they when they still solve the cases that defeat everyone else? The technophobic, annoying Bryant and smooth-talking modernist May, together with their glamorous sergeant Janice Longbright, head a team of misfits who I suppose are just as likely to commit crimes as solve them. The books are written chronologically, but I’ve cunningly arranged it so that they can be read out of order (in fact, some volumes benefit from doing so). The cases take on the different styles of the classic detective stories. The latest one, ‘Hall of Mirrors’ is, incredibly, the 16th volume featuring my senior detectives. This one, according to Bryant’s deeply unreliable memoirs, is set back in swinging London, in a grand country house called Tavistock Hall. Back then the detectives were young and energetic (they’re always playing silly word games) and are ready to solve a proper country house murder. The interesting thing about writing flashback cases is getting immersed in the period and writing about the recent past with a fresh eye. I had a lot of fun with the fashions! Although ‘Hall Of Mirrors’ is very mischievous, comedy still requires a moral viewpoint. Humour and tragedy go together very well in crime novels. However, I have to follow a set of rules, one of which is that the serious parts of my plot are taken seriously, while the comedy comes from character. It helps that my detectives are facing mortality, as it lets me use graveyard humour. I’m very careful to respect victims and honour them over villains. I don’t like books in which women are always the victims, and even when I’m being funny there is a serious intent underpinning the laughter. The mysteries reflect the way we learn to deal with life, and you’ll always find a strong underpinning of reality in the books. There are often arcane details about hidden or secret London that I’ve discovered in old libraries. Many of the weirdest facts I use are absolutely true. Having said that, I love writing Arthur Bryant most of all, because he’s so mischievous, and is usually described as looking like a disreputable teddy bear. He gets away with being rude to people because he’s everyone’s cheeky old grandfather, and knows that people will miss him when he’s gone. You can find Christopher Fowler on Twitter- @Peculiar. Hall of Mirrors was published in hardback by Doubleday on 22nd March 2018.
armed Brigadier, Nigel ‘Fruity’ Metcalf. Christopher Fowler is the author of more than forty novels (fifteen of which feature the detectives Bryant and May and the Peculiar Crimes Unit) and short story collections. The recipient of many awards, including the coveted CWA ‘Dagger in the Library’, Chris has also written screenplays, video games, graphic novels, audio plays and two critically accalimed memoirs, Paperboy and Film Freak. His most recent book is The Book of Forgotten Authors, drawn from his ‘Invisible Ink’ columns in the Independent on Sunday. Chris divides his time between London’s King Cross and Barcelona.